What on earth is a muk mat!? Spent the morning surfing but don’t want sandy feet in the car? Well you need a muk mat. Kids been outside playing sport but you don’t want grass all over the lounge room carpet? Better use a muk mat. Love camping but hate dirt in your sleeping bag? That calls for a muk mat. So what on earth is a muk mat? 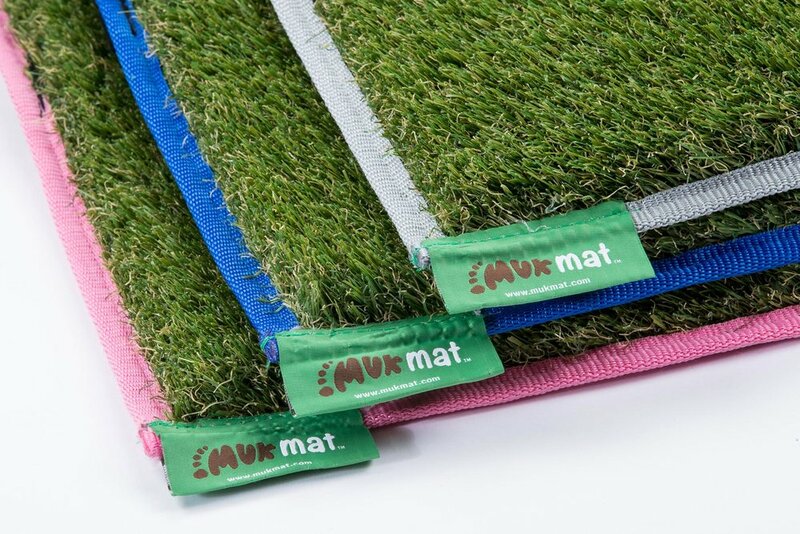 muk mat is a portable synthetic grass mat designed to get the muk off your feet and shoes. Locally handcrafted, with a sleek binding to suit your style, it looks cool, feels lush and travels easily, but most importantly, it WORKS. You will wonder how you ever managed without a muk mat. After a surf to change out of your wetsuit and avoid tramping it into the dirt, sand or bitumen. After the beach to clean sand off feet. After a run/ride to clean shoes. After kids sport to clean shoes and even get out of muddy/dirty clothes. Camping – to clean feet before getting into the tent/caravan. After golf to clean the grass off. Basically – whenever you need clean feet. I think it will live in the back of my car for sure – it will stop the sand storm that occurs in my car on a weekly basis. There is no way Isla is getting this one! Perfect out side the cabin at Hossana Farmstay - keeping the muk outside. Everyone is wanting to use Surfing Services Australia's muk mat. Keep groms feet/paws sand free. muk mat, protecting the wettie and keeping it clean. Perfect to clean the sand after a day on the boat. Natasha. Packed and ready for an active weekend.. including the all important Muk Mat. Rob. Brisbane. Gave a lovely friend a pink mukmat for her 70th birthday. She loves it and so did all the other lady golfers there. I'm going to make this a present for lots of my friends in the future. Barb. Palm Beach. First run - no sand - knobbly knees and bunions love it ! Thanks muk mat. Cara. Congratulations to Josh Grange for your win at the state titles. Nice to see the feet of a champ on the muk mat. Haven Hub - family. lifestyle - crushing on our muk mat. My new fav that will stay in the car.. muk mat. Awol family, always on the move. Here's a family that love adventure. Glad the muk mat is a welcome addition to their active life. @awolffamily. Here's a girl that loves her shoes... and very happy to keep them clean with muk mat. Erica. Adelaide. Where did the Patch Of Grass come from? We are an Aussie couple, both with a background in health and business. We have two very active boys. The whole family are keen surfers, mountain bikers, runners and campers. We love staying active outdoors, but when it’s time to come back inside, there is so much mess! Originally muk mat came about as a solution to keep the sand, dirt and grass out of our car after a surf. Then we found it useful to clean our feet/shoes after running, footy, golf, riding and camping. We’d pop our "patch of grass" on the ground, clean our feet and complete strangers would come up to us and ask what it was, where we got it and where they could get one. Australians love the outdoors lifestyle and we saw an opportunity to provide a product to make it easier to stay active and keep the muk outside.